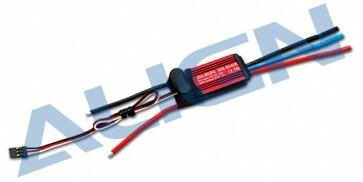 • BEC output voltage(5~6V) to show great performance on the torque & speed of servo. The Aircraft Locator Option is engaged by tuming off the transmitter. When the ESC does not receive a signal from the transmitter for 30 seconds, it will start to send an alarm to the motor. The sound of the alarm will aid the pilot to locate the aircraft. This option will not work with a PCM receiver that has SAVE function enabled, or with low noise resistant PM receivers.